The first time I went to Arches national park, we rolled into town in a bright red RV - 5 kids all under 12, three dogs - two mastiffs and a shepherd and my parents. The stories that have told since about the day they brought us to Corona Arch - my dad's fear of heights, my sister wimping out halfway up it, my baby brother Robi and his light up tennis shoes on his tiny feet. Twelve or so years later, my dad, my brother Erik, my lady Kaleigh and I took a day trip back to the park while I was home in Colorado said baby brother Robi's high school graduation. 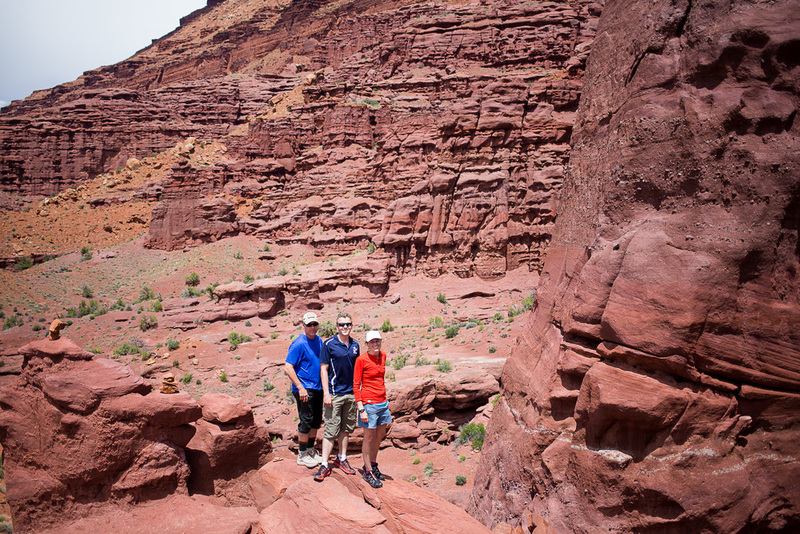 While it was storming in Grand Junction, we enjoying bright blue skies against the copper red rock the park is famous for. We had a destination in mind that we didn't get a chance to see twelve years ago... Delicate Arch. Named "Chaps" by cowboys way back when, the 65 foot tall, free standing sandstone arch has to be one of hte most iconic landmarks in the U.S.A. and despite how much we all have travelled, none of us had seen it yet. We drove through the park and arrived at the trail head around 9:30 am - just about the same time everyone else did it seemed. Moments of the 1.5 mile hike in felt a bit like a zombie apocalypse - all of the blackened silhouettes on the horizon moving slowly up the barren rock faces and amongst the scratchy sage brush. When we came around the last bend and finally saw the arch, I understood what all the fuss was about - the Delicate Arch is truly as magnificent in person as it is in photographs, if not more. I hope you enjoy the photos! We took a smidge of a detour on the way home to Fisher Towers for no reason other than that we were driving by and it looked cool and my dad wanted to get closer. There are definitely plans to go back here again soon for the great hiking and climbing these towers are known for.